Surveys show that between 40 and 60 percent of the general population has trouble sleeping. Body aches and pains, daily stress, worries, and pressures from job and family all contribute to our lack of and poor quality of sleep. Mattress companies have made it incredibly difficult to comparison shop for mattresses. Since many mattress companies use private labeling and mattress stores use different product names and different model numbers for the same or similar mattresses, the consumer is prevented from comparing “apples to apples.” The consumer is then left trying to compare mattress features, like coil count, gauge and construction. While all of this seems like a bit of a shell game, there are some things you should know to help make your mattress decision the best for you. Manufacturers of traditional spring mattress sets usually advertise their mattresses’ firmness, coil count and gauge of steel. The lower the steel gauge, the stronger the coil. 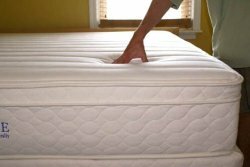 The higher the coil count, the less movement you should feel when your partner moves on the other side of the bed. However, some mattresses can have a high coil count but use higher gauge steel, which results in decreased support. Firmness equates to the stiffness of a mattress. A firmer bed does not always have a high coil count and stronger gauge steel. It could just have a stiffer foam and padding. When you are looking at mattresses, be aware that the word “plush” means “soft” in mattress speak. While this can translate into more comfort for the buyer, a plush top on an extra firm mattress may not always be comfortable or provide adequate support. The best advice we can give is LAY DOWN ON IT for 3-5 minutes with your significant other. Sitting on it is not enough! People with lower back pain tend to prefer a firmer bed. The general recommendation for these patients is not to sleep on a rock-hard bed. A firm bed prevents the low back from sinking deeply into the bed and irritating the facet joints but maintains the natural shape of the spine while sleeping. Patients with upper back and neck pain often prefer softer or plusher bedding. The softer cushioning allows the head and upper back to sink into the bed to support the cervical area. Be aware that changes in your life can signal the need for a new mattress. If you’ve lost or gained a lot of weight, if a medical condition has changed the way you sleep or even if you have changed partners, these are considerations for a new mattress. If you still have questions about choosing the right mattress, talk to Dr. Rulli on your next visit.